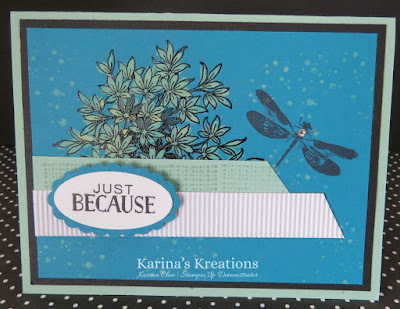 Karina's Kreations: Awesomely Artistic Bleach Card Technique! Awesomely Artistic Bleach Card Technique! We made this cute technique card at my Super Fun stamp night class. The card uses the Awesomely Artistic stamp set and the bleach technique. I made a video for you. I just wanted to point out that I used an old aqua painter not a blender pen like I said in the video. Mint Macaroon 5-1/2" x 8-1/2"
Basic Black 4" x 5-1/4"
Island Indigo 3-3/4" x 5"
Mint Macaroon 3/4" x 4"
White Corrugated card stock 3/4" x 4-3/4".